Synthetic peptide within Human Aurora B aa 1-100 (N terminal). The exact sequence is proprietary. Our Abpromise guarantee covers the use of ab45145 in the following tested applications. WB 1/50000. Predicted molecular weight: 39 kDa. May be directly involved in regulating the cleavage of polar spindle microtubules and is a key regulator for the onset of cytokinesis during mitosis. Component of the chromosomal passenger complex (CPC), a complex that acts as a key regulator of mitosis. The CPC complex has essential functions at the centromere in ensuring correct chromosome alignment and segregation and is required for chromatin-induced microtubule stabilization and spindle assembly. Phosphorylates 'Ser-10' and 'Ser-28' of histone H3 during mitosis. Required for kinetochore localization of BUB1 and SGOL1. Interacts with INCENP. Note=Disruptive regulation of expression is a possibile mechanism of the perturbation of chromosomal integrity in cancer cells through its dominant-negative effect on cytokinesis. Ubiquitinated by different BCR (BTB-CUL3-RBX1) E3 ubiquitin ligase complexes. Ubiquitinated by the BCR(KLHL9-KLHL13) E3 ubiquitin ligase complex, ubiquitination leads to removal from mitotic chromosomes and is required for cytokinesis. During anaphase, the BCR(KLHL21) E3 ubiquitin ligase complex recruits the CPC complex from chromosomes to the spindle midzone and mediates the ubiquitination of AURKB. Ubiquitination of AURKB by BCR(KLHL21) E3 ubiquitin ligase complex may not lead to its degradation by the proteasome. Nucleus. Chromosome. Chromosome > centromere. Cytoplasm > cytoskeleton > spindle. Localizes on chromosome arms and inner centromeres from prophase through metaphase and then transferring to the spindle midzone and midbody from anaphase through cytokinesis. Colocalized with gamma tubulin in the mid-body. ab45145 showing positive staining in Normal tonsil tissue. Immunofluorescent analysis of 4% paraformaldehyde-fixed, 0.1% Triton X-100 permeabilized HeLa (Human epithelial cells from cervix adenocarcinoma cell line) cell lines labeling Aurora B with ab45145 at 1/500 dilution, followed by Goat Anti-Rabbit IgG H&L (Alexa Fluor® 488) (ab150077) secondary antibody at 1/1000 dilution (green). 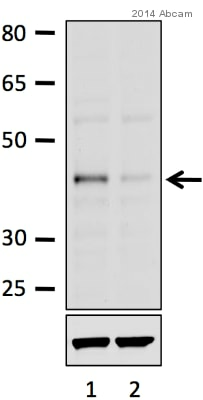 Tubulin is detected with Anti-alpha Tubulin antibody [DM1A] - Loading Control (ab7291) at 1/1000 dilution and Goat Anti-Mouse IgG H&L (Alexa Fluor® 594) preadsorbed (ab150120) at 1/1000 dilution (red). -ve control 1: ab45145 at 1/500 dilution followed by ab150120 at 1/1000 dilution. Ab45145 staining human Aurora B in human Hodgkin lymphoma by immunohistochemistry using paraffin embedded tissue. ab45145 showing positive staining in Breast carcinoma tissue. ab45145 showing positive staining in Cervical carcinoma tissue. ab45145 showing positive staining in Urinary bladder transitional carcinoma tissue. ab45145 showing positive staining in Lung adenocarcinoma tissue. Publishing research using ab45145? Please let us know so that we can cite the reference in this datasheet.